The CellFacts II System provides a robust, rapid microbiology solution for manufacturing and processing industries. Instead of incubating agar plates or dip slides over a period of many days, the CellFacts II Analyzer counts, measures and analyzes each microbe in the sample as it passes through the instrument. This process takes a matter of minutes, so that results can be obtained in real time in comparison to the usual five or more days for classical methods. 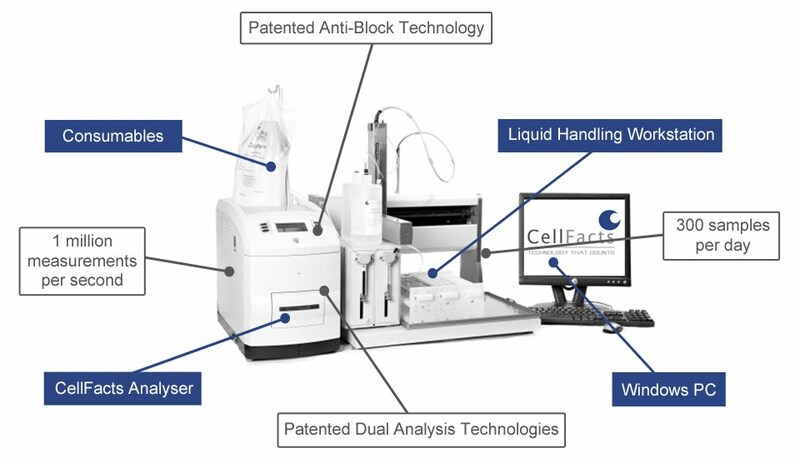 A range of applications is available for the CellFacts II instrument and each is specially designed to work with high particulate challenging sample types such as calcium carbonate slurries, paints, pigments and stains, soluble oil, powdered milk and fruit juice products. Our team of microbiology experts customize each CellFacts application for your specific samples, ensuring that your CellFacts solution is tailored to fit the requirements of your business and the objectives you wish to achieve. Each application is configured with simple pass or fail results and red, amber and green "traffic light" flags that allow the operator to quickly decide on the proper course of action. In addition to traffic lights, CellFacts data can be used to analyze trends, which naturally form over time as data is acquired and results are cumulated. By using trend analysis, a greater understanding of the microbiology of product and process will be arrived at. This provides the basis for intelligent decisions to proactively manage contamination, which will provide the potential for significant improvements for your manufacturing process. Browse our current range of Applications from the menu. If your Application is not listed, please contact us to see if we can help.